Ceramic tile is a natural product made up of clay, a number of minerals, and water. Glazed ceramic tile has a ceramic coating applied to the tile body, which gives the tile its color and finish. Glazed ceramic tile is the natural choice for your interior floors and walls. For centuries, marble tile has been a symbol of affluence, exuding sophistication and an air of artistry that make marble tile a classic choice. Marble tile for flooring is renowned for its ornate, refined beauty. Marble slabs and marble tile has been a common feature in the Greek and Roman spas of the ancient world, to Renaissance courtyards in Europe, al the way to the Trump Tower in New York City today. The reputation marble has for opulence has not diminished through the ages! If you are applying your tile by the sheet, simply apply the adhesive to your surface, square up your sheet and lay the uncovered side on the adhesive. Once the adhesive has dried, wipe the paper facing down with a damp sponge until it darkens, then peel the sheet the sheet off in a single piece. Your tiles will be pre-set with 1/16th” grout joints. Porcelain tile is a reliable option for refined beauty in flooring, as well as being durable to high foot traffic and highly resistant to moisture. Often standing as an alternative to stone tile, porcelain tile remains in a class by itself; an ornate addition to kitchens and bathrooms in particular. Baked at higher temperatures in the kiln than most ceramics, resultant porcelain tile is a harder material, making it a great choice in areas of foot high-traffic. The beauty of slate tiles is that no two pieces are the same. Each piece is unique in shape, size, and color, which guarantees your floor is one of a kind! Slate is available in a multitude of colors, ranging from vibrant reds, oranges, and golds, to darker greens, blues, and browns. 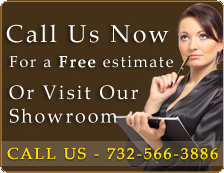 Call (732) 566-3886 today to speak to one of our experienced tile contractors. Located in Matawan (Monmouth County, NJ) just off Route 34, Tiles Unlimited, helps customers throughout the State of New Jersey including but not limited to Monmouth County.